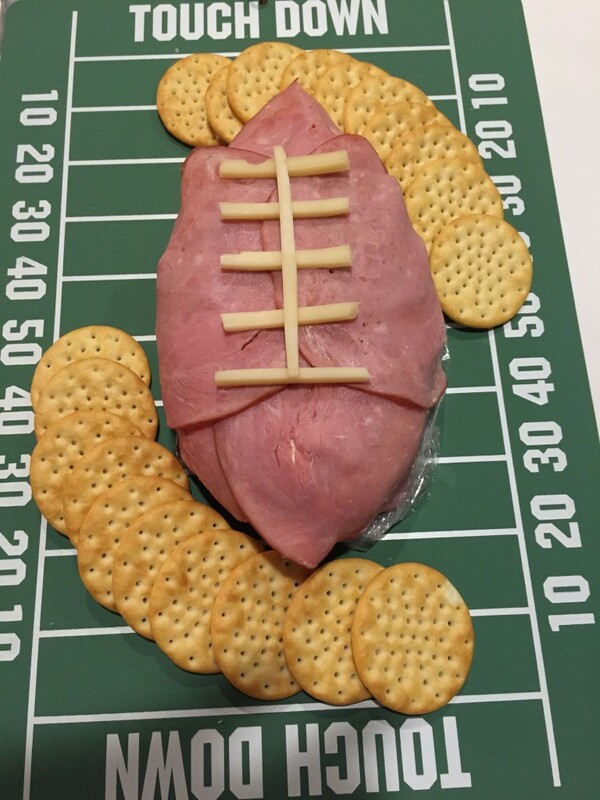 This post is from last year’s Super Bowl. 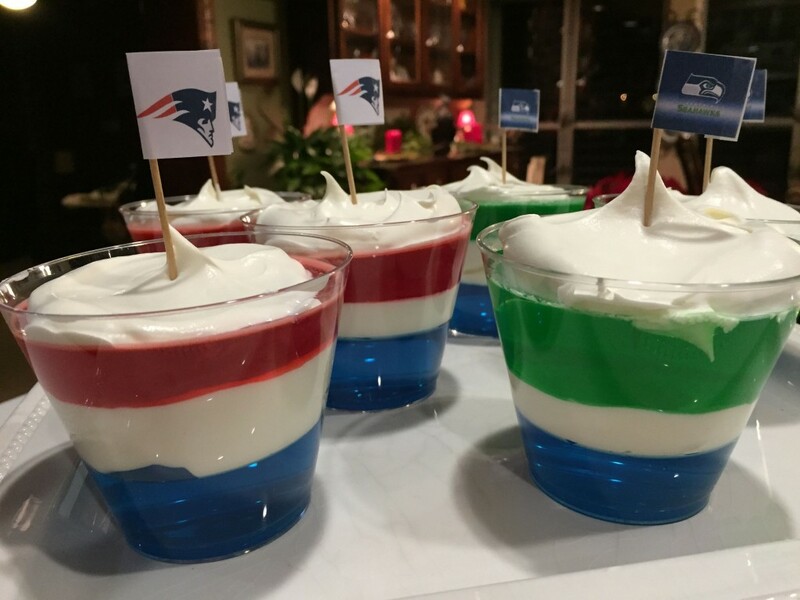 Even though it’s not looking good for the Colts again this year, I still plan to throw a party! I think these were some good ideas that are worth sharing again. Any of them can be tweaked depending on which teams end up playing! I’m the first to admit I have little interest in sports. But when a sporting event gives me a good excuse to throw a party, then I’m in! Thankfully, Dawn is a huge sports fan so she was able to make up for my lack of knowledge about this particular subject (and she came up with the cute names). Even though we live in Indianapolis and were quite disappointed that the Colts didn’t make it to the big game, we still plan to enjoy the party! 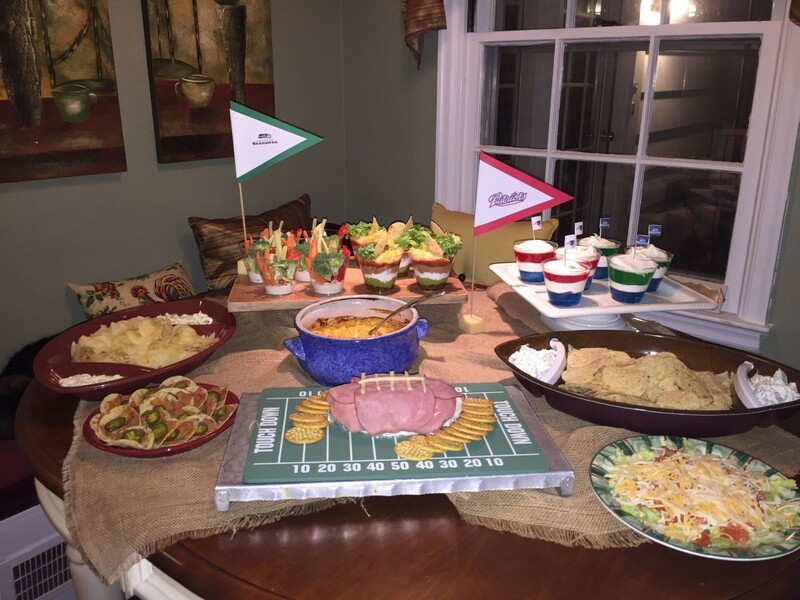 Traditionally, Super Bowl food is made up of snacks and dips – anything that allows your guests to make multiple trips to the food table in between the important moments of the game. 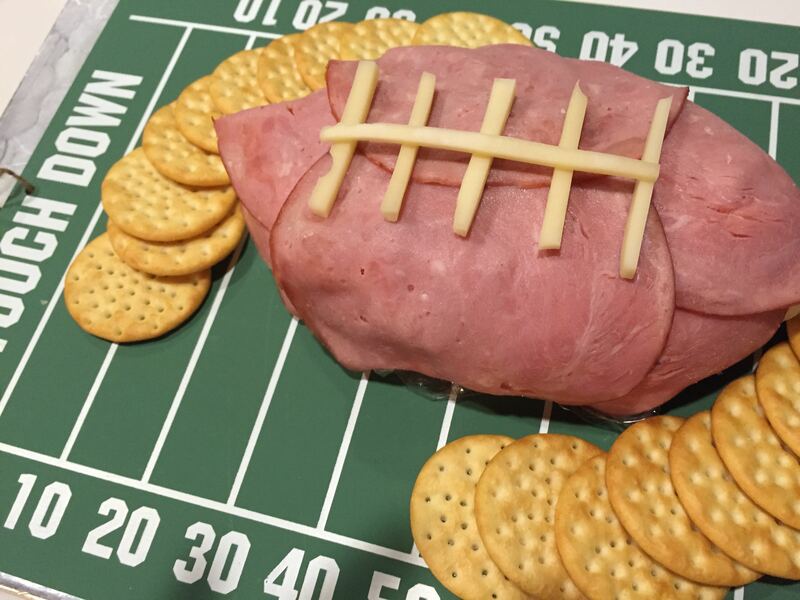 We have put together quite a few recipes that will work well for your Super Bowl party. 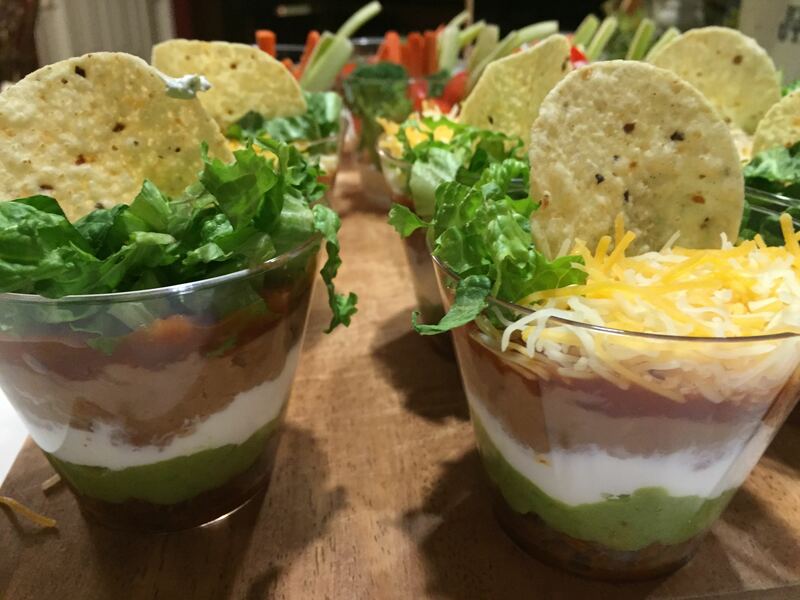 We like the idea of the guests simply grabbing an individual cup of yummy layered taco dip. Makes less mess and is much easier to serve. When Dawn suggested a dill pickle dip, I wasn’t sure about that at all. I like dill pickles but couldn’t quite imagine it in a dip. But it is absolutely delicious! 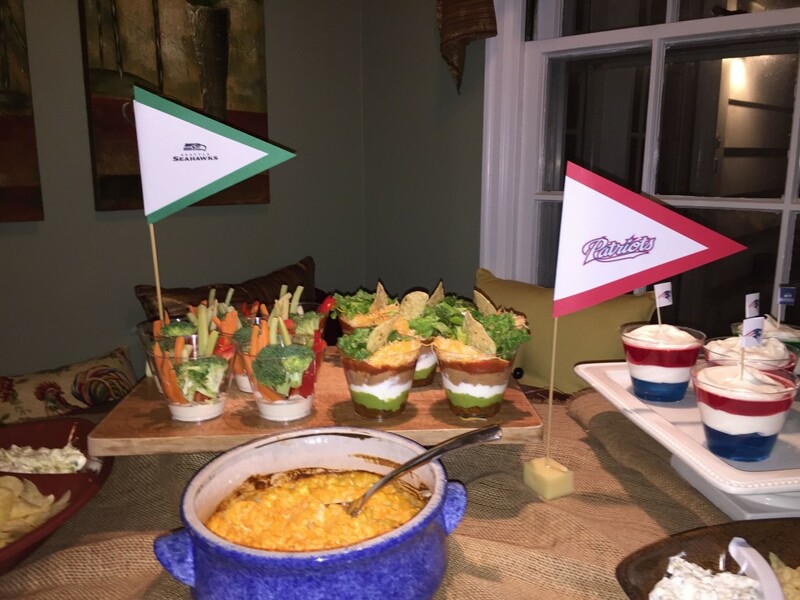 You can’t have a Super Bowl party without nachos, right? 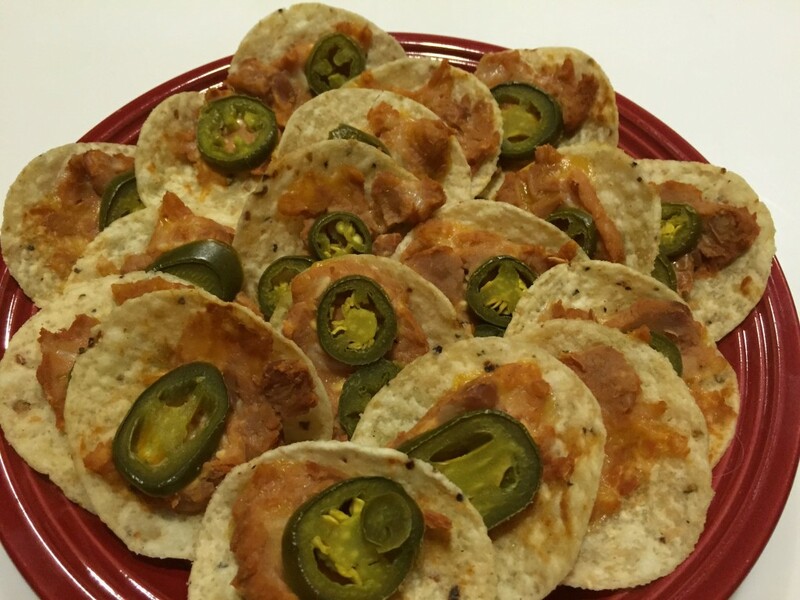 These nachos pack a kick with a jalapeño slice on each chip. 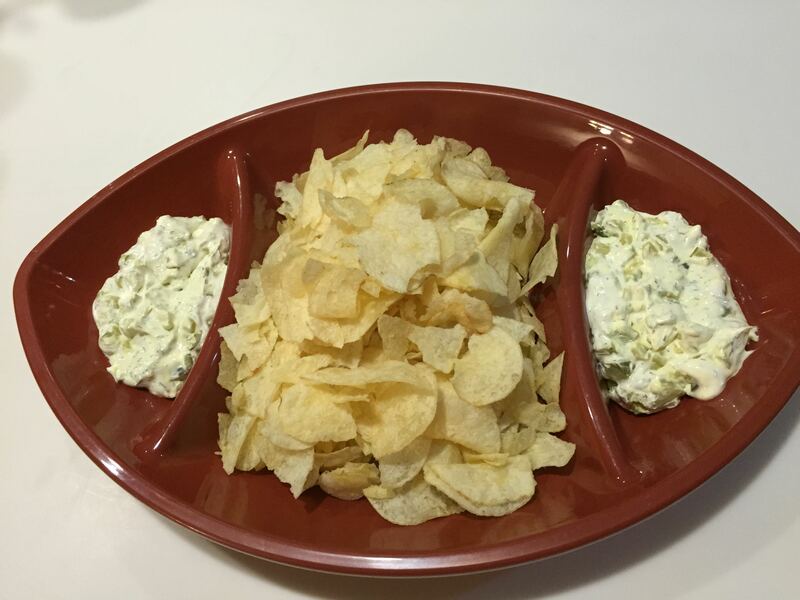 Dawn is famous for this dip. It is actually one of my earliest memories of her when she joined the family. She brought her broccoli dip and we knew it would always be in demand at future family gatherings. Cheese balls are great because you can form them into fun shapes that can fit your occasion. 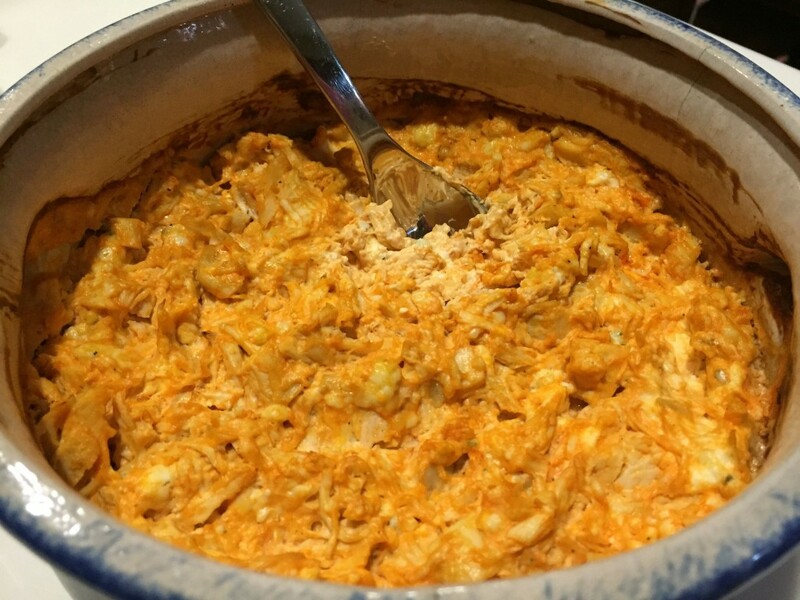 This cheese ball was fun to make and is delicious as well. 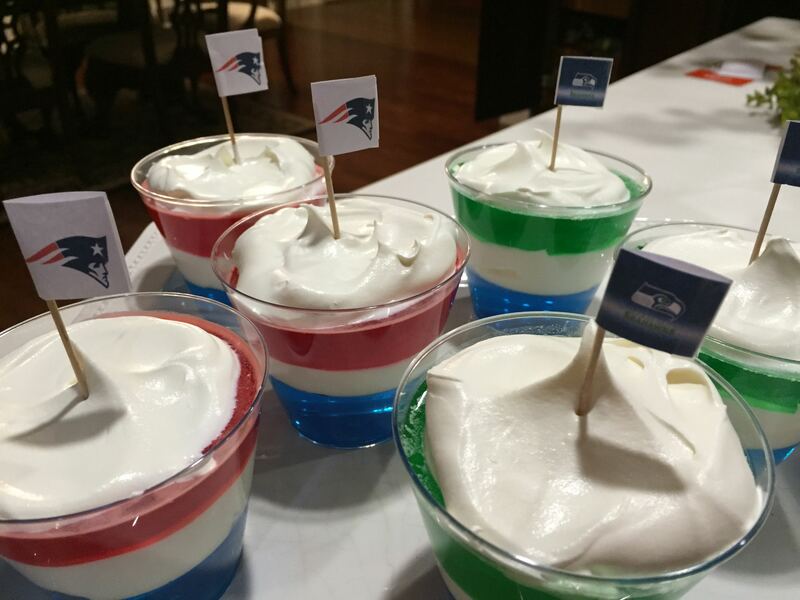 Another great serving idea. 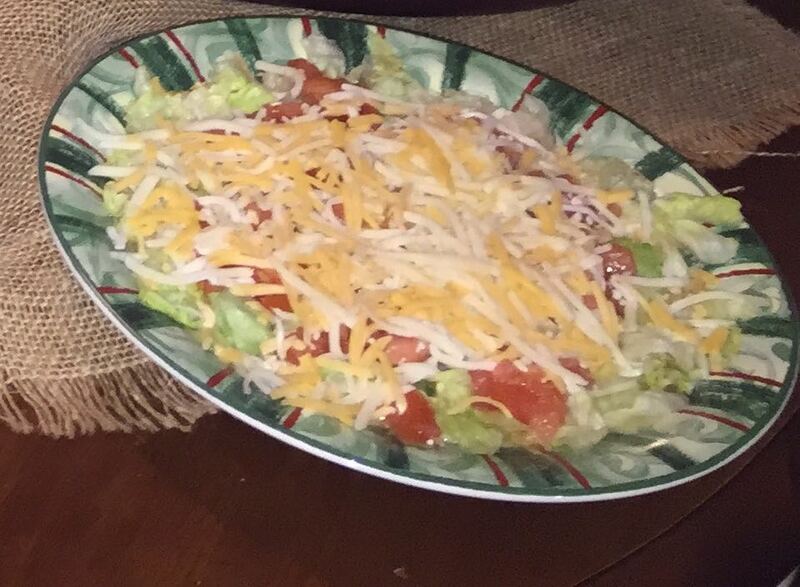 Put the dressing on the bottom of a plastic cup and the fresh veggies on top. Might even convince people to eat something a little healthy at a typically non-healthy party! 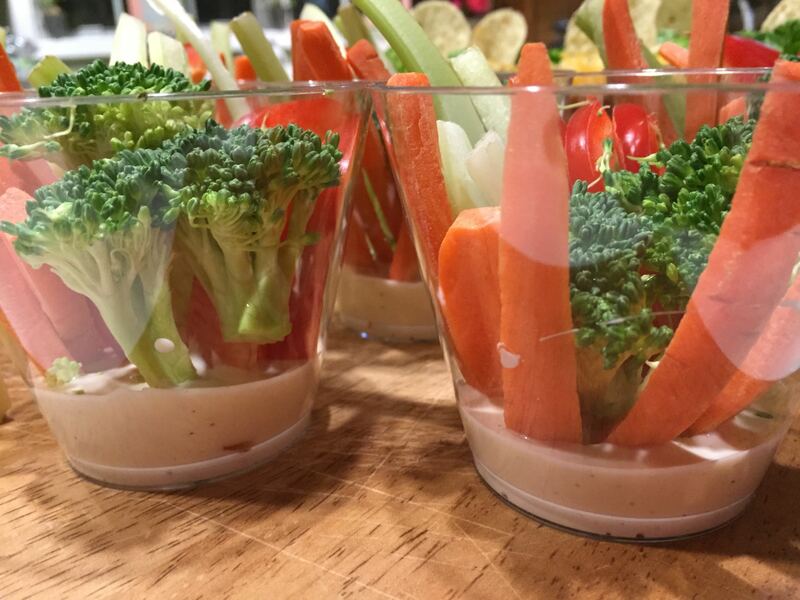 No recipe needed – after pouring dressing on the bottom, just wash and cut some fresh vegetables and arrange them in the cup! We had hoped to make blue and white jello for the Colts, but since that didn’t work out, we went with the Patriots and Seahawks. 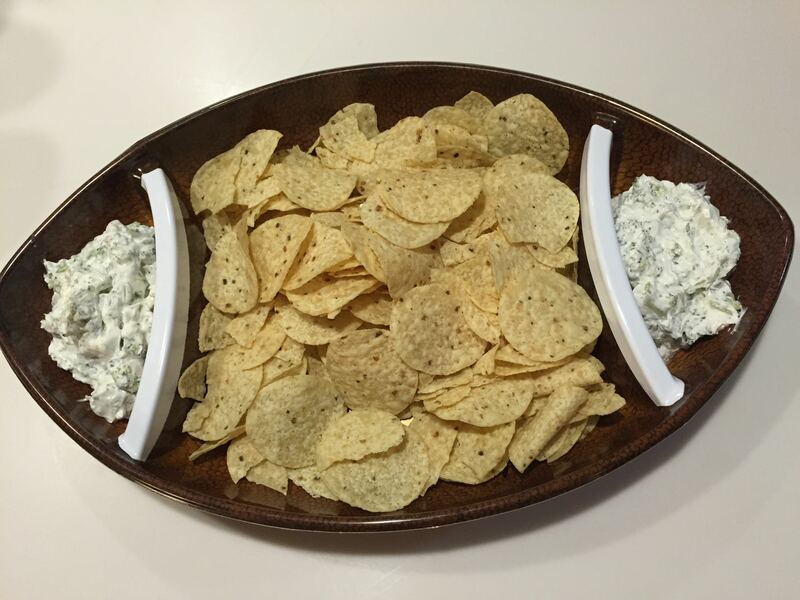 Football fans will love this spicy dip. Be sure to make plenty because it won’t last! This recipe is so easy and always popular.